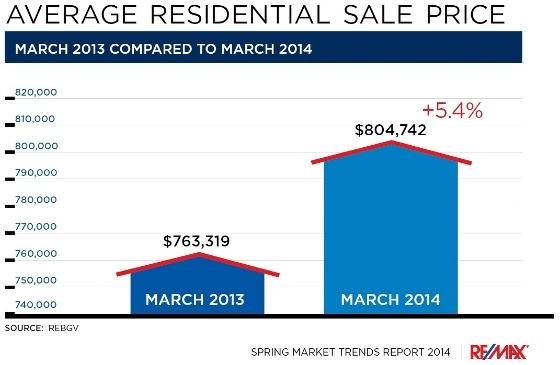 The RE/MAX Spring Market Trends Report 2014 is now out, highlighted by an increase in Western Canada's housing market. The Vancouver area has already shown year-over-year price gains with a 5.4% increase in year-over-year prices by the end of March. These gains have been balanced between home inventory levels and demand, creating a balanced market that's proven beneficial to both home buyers and sellers. Our unique combination of temperate climate, social, cultural and economic links to China along with our stunning sea to mountain scenery continues to drive the desire to live here. Now, there's a a growing selection of home affordability that includes tradtional single family homes in the suburbsto those with rental suites, multi-generational homes, laneway housing and innovative townhome and condo designs that opens up home ownership to more people than ever. So whether you're buying or selling this season the market is in your favor. Want to learn more? Email me today at bob@bobsethi.com for your free copy of the full RE/MAX Spring Market Trend Report 2014. Home Sellers, click here to see what neighborhood homes like yours are selling for. Home Buyers, click here to find the home you're looking for before other homebuyers. *Need help with these free services? Don't hesitate to call or email me today. All information from sources believed to be reliable. For more information, please contact the author.